We Repair all brands and makes of dishwashers. We Repair all brands and makes of dishwashers including Admiral, Ariston, Amana, Asko, Bosch, Broan, Caloric Dacor, DCS, Electrolux, Fisher & Paykel, Frigidaire, Gaggenau, Garland, General Electric, Gibson, Hotpoint, Jenn-Air, Kenmore, Kitchen Aid, LG Electronics, Magic Chef, Marvel, Miele, Maytag, O’Keefe & Merritt, Roper, Samsung, Siemens, Speed Queen, Sub Zero, Tappan, Thermador, Viking, U-Line, Wedgewood, WindCrest, Whirlpool, White Westinghouse, Wolf and more …. If your dishwasher won’t drain, try cleaning the filter at the bottom of the dishwasher and then run the dishwasheer again. If this doesn’t work call a plumber or dishwasher repair specialist. This could be due to several causes. Be sure the door is latched securely and that the water is turned on. Check that the dial pad is properly selected for the cycle and that the cycle has started. Check your home’s circuit breaker or fuse box. Check inlet hose for kinks or sediment; clean if necessary. My Dishwasher Won’t Drain Water in the Bottom of the Tub. Check your home’s fuse box for any blown fuses or circuits. Check that the dishwashing cycle is actually completed. Check drain hose for a kink and be sure the drain hose is elevated in the drain or disposer. If hooked up to a garbage disposal, be sure the knockout is removed from the disposal inlet. My Dishwasher’s Detergent Cup Is Not Empty. Check to see if the dishwasher cycle has actually completed. Make sure the dispenser is not blocked; clear it if you can. Be sure to use fresh dishwasher detergent which has been stored in a cool, dry place. My Dishwasher is Making Noise. A variety of odd noises can be expected with normal dishwasher operation including the sound of a water valve hiss during filling, humming during draining, water circulating/swooshing…even ticking sounds (usually just the timer). Thumping and snapping sounds are usually the wash arm bumping an item that is extending beyond the racks or the detergent cup lid hitting the door liner when the dishwasher door is opened at the end of the cycle. Be concerned if the noise is something you haven’t heard before, is forceful or sounds like it may be breaking your dishes. Check to make sure that the dishwasher is level. Too many suds can cause the dishwasher to overflow; make sure you are using the right kind of detergent and in the proper quantity. Use less detergent in soft water than in hard water. Check seals along dishwasher door for cracks and damage. If leakage continues and is more than just a few droplets, call a plumber or experienced dishwasher technician. My Dishes and Dishwasher Interior are Stained and Discolored. Aluminum utensils and pans can leave marks when they rub against other items; leave a slight space between them. Iron in the water can leave a yellow, brown or orange film; you may need to install a rust filter. Some foods and sauces (eg. tomatoes) may stain dishes and interiors; try using a dishwasher detergent that contains citric acid. Also, check the dishwasher rack for nicks or scratches in the plastic finish; if you notice any areas of your diswasher rack or interior with exposed metal, repair them as soon as possible with a plastic coating material or a water-proof sealant. Use a rust remover or fine steel wool to gently scrub rust and stains from dishwasher tub and walls. My Dishes Don’t Get Clean. Is there enough water? Test this by starting a cycle and allowing the unit to fill. When it is washing, open the door and check the water level; it must reach the heating element for the pump to work well. If it doesn’t reach the heating element, you may need to replace the water valve. If the water does reach the heating element, you may have more serious problems; consult with a plumber or dishwasher technician. Do you have a blockage? Check both spray arms for foood particles and debris. 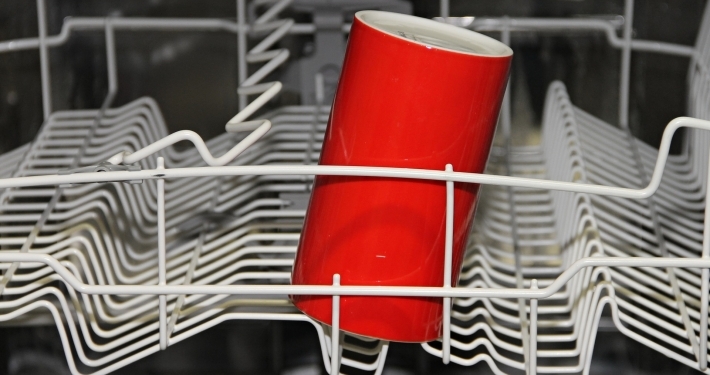 Are you overloading the dishwasher? Try less dishes or putting too many large items (such as pots and pans) on the bottom rack. You may be impeding water from reaching all of your items. Follow manufacturer’s instruction for loading dishes to allow for proper water circulation. My Dishes Remain Wet After I Use the Dry Cycle. Be sure the heated dry setting is selected. Use a rinse aid regularly to improve drying. (Many dishwasher models come equipped with an adjustable rinse aid cap; turn the cap towards the MORE setting.) Check water temperature; if water is too cold, it won’t evaporate. Make sure dishes are loaded properly to allow for proper evaporation and dripping/draining; place dishes so water won’t accumulate. Plastic and Teflon items have porous surfaces that retain water; towel drying may be necessary. My Dishwasher is Filled With Suds. Sprinkle table salt across the suds to disperse them. Add a large quantity of ice cubes into the dishwasher to lower the water temperature and reduce the sudsing. Soak up as much water and suds as you can with a dry towel. Run the dishwasher again in rinse mode and repeat the salt and ice again if necessary. As a last resort, add a cup of liquid fabric softener to break up the sudes. Let the dishwasher run for a few seconds, then select the drain cycle.